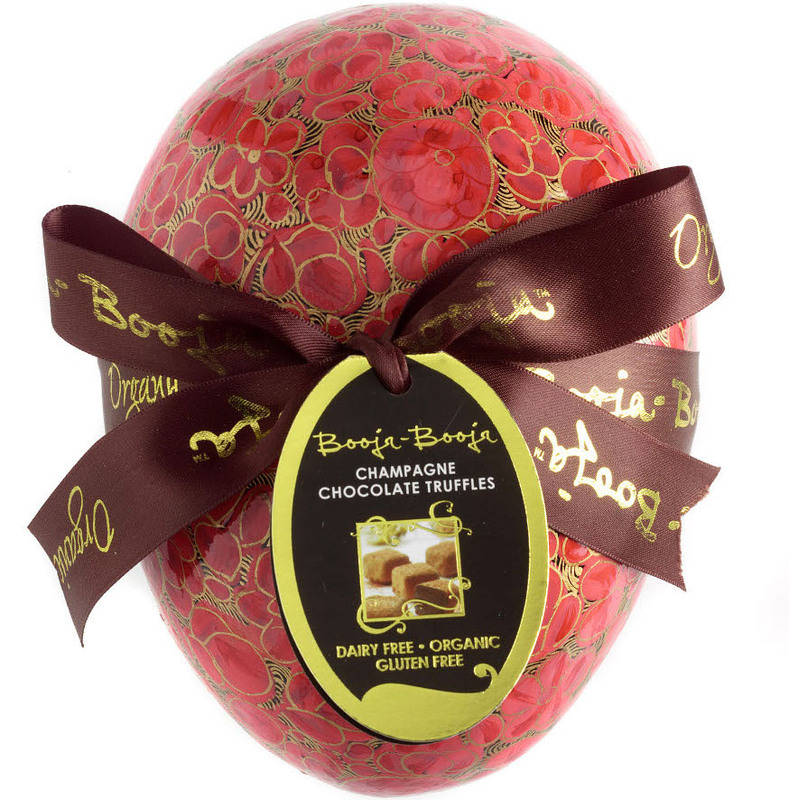 Spoil your loved ones with Booja`s intricately decorated egg shaped trinket box, filled with deliciously decadent Booja Booja Champagne truffles. Please note that the design of your egg will be different to the one pictured, but will be equally as lovely! More about Booja Booja Champagne Egg ... The handpainted box is created by Kashmiri artisans, and by working with Booja Booja, they have gained a sustainable income and a more stable lifestyle. The box makes this Easter gift extra special and long-lasting; it's designed to be kept and treasured. It's a more eco-friendly way of packaging too, with non of the wastage often associated with Easter treats. Dark Chocolate* (cocoa solids* (56%), cane sugar*, soya lecithin, vanilla*), Coconut Oil*, Corn Syrup*, Champagne* (9%), Cocoa Powder*. (* Indicates 'Organic'). Keep in cool and dry larder, away from sunlight. Product Info: While we have taken the upmost care in preparing this summary and believe it is accurate, it is not a substitute for your reading the product packaging and label prior to use. You should note that products and their ingredients are subject to change. If you do require precise ingredient information you should consult the manufacturer, whose contact details will appear on the packaging or label.